WACO, Texas—Food prices in Texas remain fairly steady this year with a basket of 16 staple grocery items totaling $44.91, up just one-half of one percent from last quarter at $44.66 and down more than one percent from $45.43 last year, according to Texas Farm Bureau’s (TFB) Grocery Price Watch. One grocery section appears to be bucking the trend, though, as Texans are paying less in the dairy aisle. Lower prices for ice cream and cheese, as well as a 4 percent annual decrease in the price of milk, are causing tighter margins for Texas dairies. Dairy farmers are struggling to stay in business as feed costs have increased dramatically and retail prices remain low. According to the Texas Association of Dairymen, nearly half of all Central Texas dairies in operation a decade ago have closed due to the difficult financial situation. Of the 16 items surveyed, seven decreased in price from the second to third quarter, while nine items either increased or remained level. The largest quarterly increase to the survey basket was fresh grapefruit, up 4 percent from the second quarter. In fact, more than one-third of survey shoppers could not find grapefruit in their local grocery stores, as the citrus fruit currently is out of season. A head of lettuce and vanilla cake mix cost the same as last quarter, while Texans paid less for fresh tomatoes, bread, Corn Flakes, rice, cheese, Blue Bell Homemade Vanilla ice cream and ground beef. 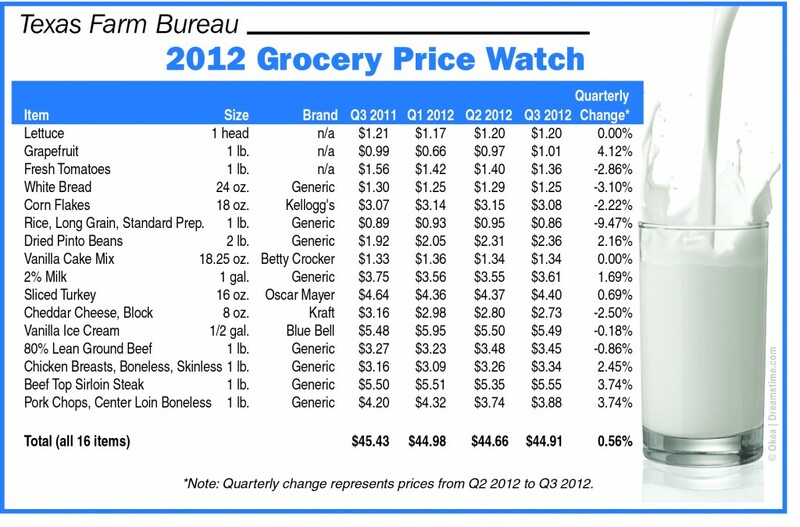 The TFB Grocery Price Watch is conducted quarterly by volunteer shoppers at grocery stores across the state of Texas. The current survey data was collected by 31 shoppers from Sept. 21-28, 2012. TFB has monitored Texas food prices through its Grocery Price Watch survey since March 2009. For a detailed list of prices from the current and previous Grocery Price Watch surveys, please download the accompanying high-resolution chart. 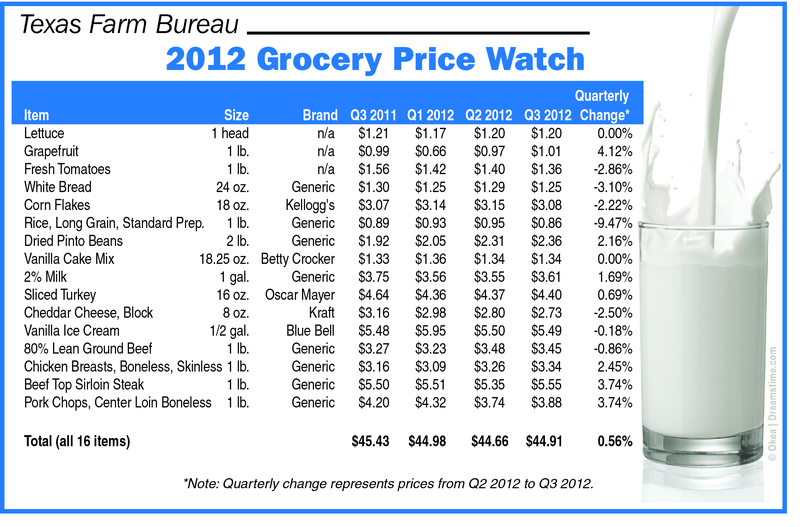 Note: Click here to download a high-resolution file of the Q3 2012 Grocery Price Watch chart.